Around a two hour drive from Bangalore, Sangam and Mekedatu are ideal for a day’s getaway. The heat right now might deter you, but if you’re upto braving the hot sun, go for it! Sangam is the confluence of the river Cauvery and Arkavathi and is accessible via Kanakpura Road. The river flows through a deep gorge at the point called Mekedatu. The gorge is deep and at some points the rocks bridges the river, so a goat can leap across. Therefore, the name Meke (goat) Datu (leap). Looking for a relaxing weekend out from Bangalore? 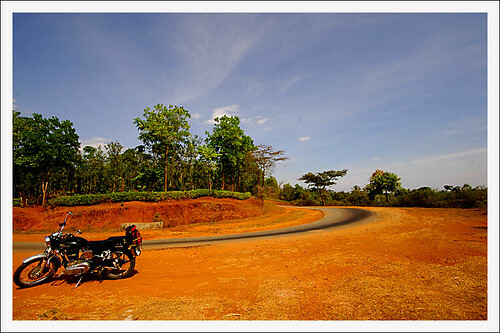 A 4-5 drive away from the city is the coffee country of Sakleshpur. Nestled in a coffee plantation in Hosamane (about 23 kms from Sakleshpur town) is the Coffee Valley homestay, where you can head for a lazy and peaceful time. I was at Nandi Hills last morning to enjoy the pleasantly cold winter weather up there. I was there early in the morning – a time I would still be in bed if it was a week day. It was windy and foggy on the top, and the hill was covered by clouds all around it. When the sun was high and the clouds started dissolving, birds came out for their daily grind in search for food. I was lucky to spot a few pretty birds, and among them were a Paradise Flycatcher, Blue capped Rock Thrush and a Tickell’s Blue Flycatcher. I spent nearly an hour photographing them. Here are the pictures. Magadi is about 50 kms from Bangalore and makes for a nice weekend drive. There are quite a few sights on the way, including the Thippagondanahalli Reservoir, an old fort in the town and also the Ranganathswamy temple just outside the town. T.G. Halli supplies drinking water to 20 per cent of the city and entry from the main gate is restricted. But the backwaters can be approached from outside Magadi Town. You might need to be a resourceful to find the entrance, but it’s worth it! Hogenakkal, A destination to relax in water when you need a break from city life. Hogenakkal falls is a part of Cauvery River which flows towards Tamilnadu from Karnataka where you can take a look of multiple waterfalls, plain water floating which is ideal for relaxing in water, view a beautiful water float in between the deadly rocks…. Beautiful view of Cauvery River @ Hogenakkal. although there are very few birds that we could spot ( We reached there in afternoon and forest guard, Ruben while rowing us around,explained us that this may not be the right time to expect the birds ‘you should make it early morning 6 am – 8 am or late noon 5pm – 6pm, also the good season here would be Feb-Mar-Apr’) we will certainly be visiting them again!! Will reserve more details via a separate post in near future!! When it is food, Kamat’s are quite serious about the taste, ingredients and the service, simply to say they have redefined the hospitality industry as a standard. With a long day at hand we decided to drive down for a afternoon meal at Kamat’s Lokaruchi at Ramnagaram, on Mysore – Bangalore Road (approx 50 kms from Bangalore towards your right if your driving from Bangalore).. near the famous janapada loka! About an hour and a half’s drive (65 kms) north of Bangalore is Nandidurga or Nandi Hills, located at 4851 ft. (1478 meters) above sea level. A long long time ago, it was the summer capital of Tipu Sultan. It’s a pleasant drive up the hill to the top of Nandi Hills, from where you can enjoy some great views, walk around the small paths and get lost, explore the temples at the base and top of the hill and chill out in the playground area.